Elmbridge Xcel Leisure Complex at Walton-on-Thames is encouraging people to reduce their carbon footprint by cycling or taking the bus to Xcel! 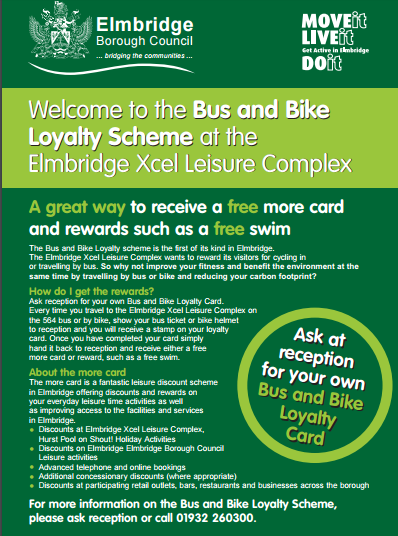 Every time you travel to the Elmbridge Xcel Leisure Complex on the 564 bus or by bike, show your bus ticket or a proof that you have cycled in to reception and you will receive a stamp on your loyalty card. Once you have completed your card simply hand it back to reception and receive either a free more card or a free swim.